Art by David Wynne. Prints and cards available until 5/31/2015 in the shop, or contact David for the original. In which Nightcrawler does Weird Tales; Iceman does Back to the Future; we want a vacation home in Dave Cockrum’s brain; Bamfs are terrible; the 1983 Iceman miniseries is straight-up bananas; parents just don’t understand; and Rachel will take literally any excuse to talk smack about John Ruskin. NEXT WEEK: X-Men ’92, with Chris Sims and Chad Bowers! I’m just glad the Vanisher quit dressing in an outfit made entirely of bathmats. 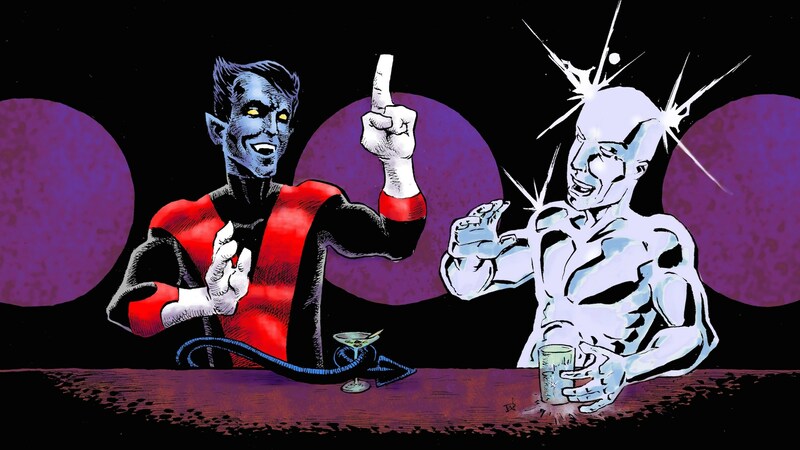 The Nightcrawler series will be reprinted in the next X-men Epic Collection, later this year. Oh, nice! Do you have a link to what’s going to be in that one? The Iceman mini-series has also been reprinted, albeit in black and white, in Essential Defenders #7. 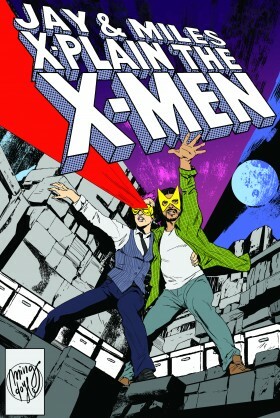 Bizarre Adventures #27 can be found in the Uncanny X-Men Omnibus Vol. 2. Oh! Essential Defenders #7 also collects the Beauty & the Beast mini in case nobody brought it up back in the Dazzler episode. Isn’t John Ruskin the guy who divorced his wife because he didn’t like her body? Explicitly because she was post-pubescent, yes. John Ruskin was the goddamn worst. I actually bought these minis off the racks back in the day. This was the time when I first got into comics in middle school, inspired in part by the “Spiderman and His Amazing Friends” series. I picked up the X-Men almost entirely because I thought they looked cool based on their cartoon appearances (and got confused very, very quickly, as this was right after Storm lost her powers and went punk, and then there were dire wraiths and Kulan Gath and Rogue was just really hard to understand for a newcomer, and well … all that). I also picked up The New Defenders because Iceman was in it, and the surreal tone of the miniseries very much reflects the tone of the comic he was in at the time, which I think you guys talked about a little in the X-Factor podcast. I’m not sure if DeMatteis was still writing the comic at the time, but he definitely set the tone. I thought it was all remarkably crazy, but since I was new to comics, I had no context to think there was anything unusual about it. It is funny to look back on the kinds of comics that got me into collecting and realize how strange they were. I know its not an X-men title, but I’m surprised neither of you mentioned Moonshadow, J.M. DeMatteis and Jon J. Muth’s graphic novel. I would consider that to be the work most associated with DeMatteis,and there are some interesting parallels between that story and the Iceman miniseries. I forever after felt that all other Wolverines are inferior to the version from those stats, because no other Wolverines could chew up & spit beer cans as genuinely effective ranged weaponry. If you can find or make a scan of that, we’d be forever grateful! I SECOND THIS SENTIMENT SO HARD. It has the characters from Kitt’s Fairy Tale on pages 36-38 of the PDF. A pdf of them is available here in the “Compiled Marvel Phile”. Pages 37-39 have the characters from the Nightcrawler limited series. Thanks, all! This is awesome. Clearly, I have been beaten to the punch! I am glad that such stuff is available online. Dragon didn’t have a whole lot of Marvel stuff (to my memory), so this always stood out in my memory. Nice One Flew Over the Cuckoo’s Nest reference in officer Ratchit’s name. Nightcrawler and She-Hulk starring in a bonkers meta-aware team-up book? Yes, please. Is there anything that is comparable to this Cockrum nightcrawler run, writing-wise and ridiculousness-wise?